Yes, I would say it is HMS Hood. Nice shot guys but unfortunately no. The Hood had no portholes around the area of her citadel. 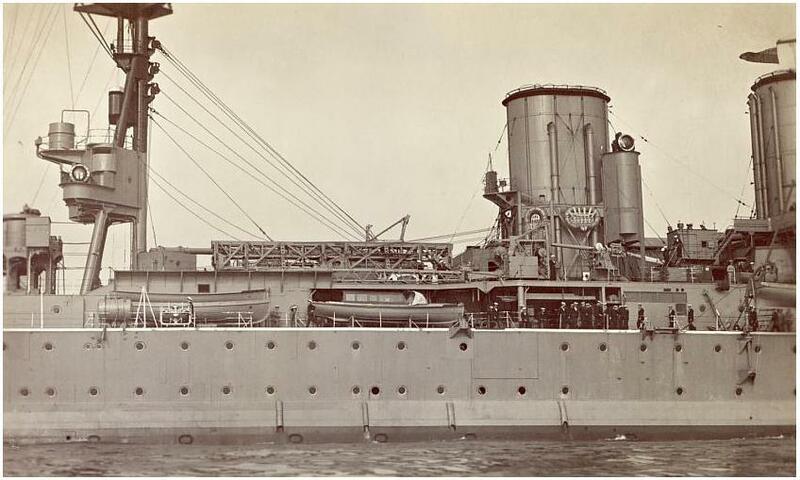 Additionally, she had several single secondary guns below the boat deck, at least three of them should have been visible here. I think Renown or Repulse, but if so I don't know which ... they both changed over the years, although there is a bulge showing. I can't remember which one had the 4.5" twins but I will guess this is Repulse. 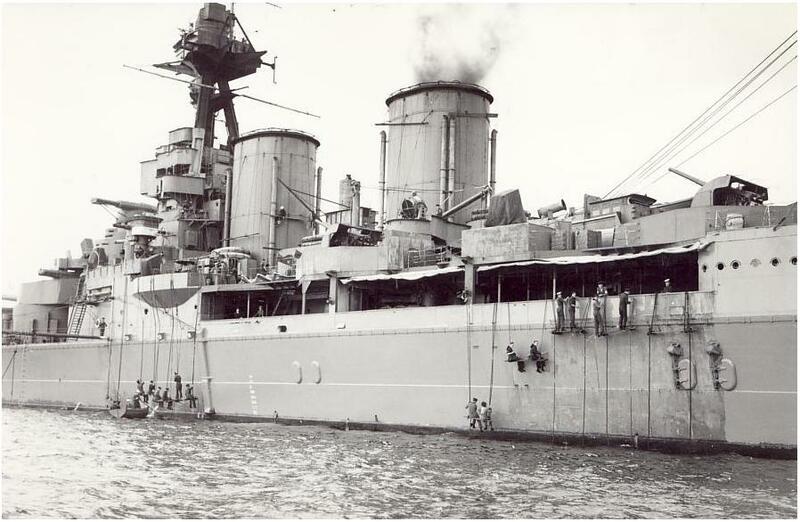 This is HMS Renown. The top of her bulge and lack of external belt armor are unmistakable. Renown or Repulse for sure. One has to look at the different sized funnels, the mainmast, and portholes in the hull. Terje, very nice photo by the way. 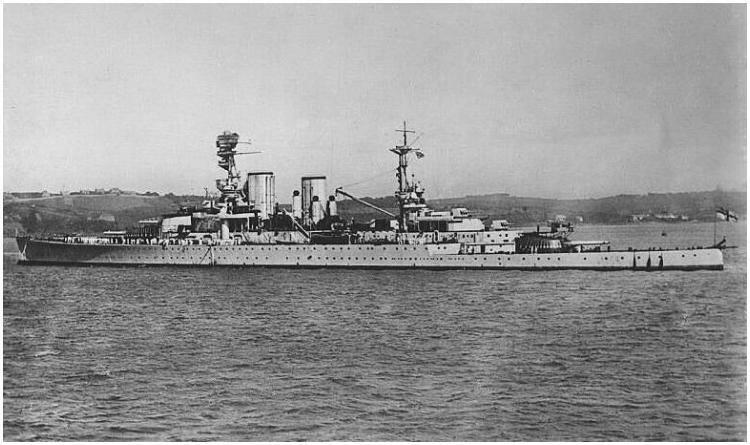 RNfanDan wrote: This is HMS Renown. The top of her bulge and lack of external belt armor are unmistakable. He shoots ... and he scores. 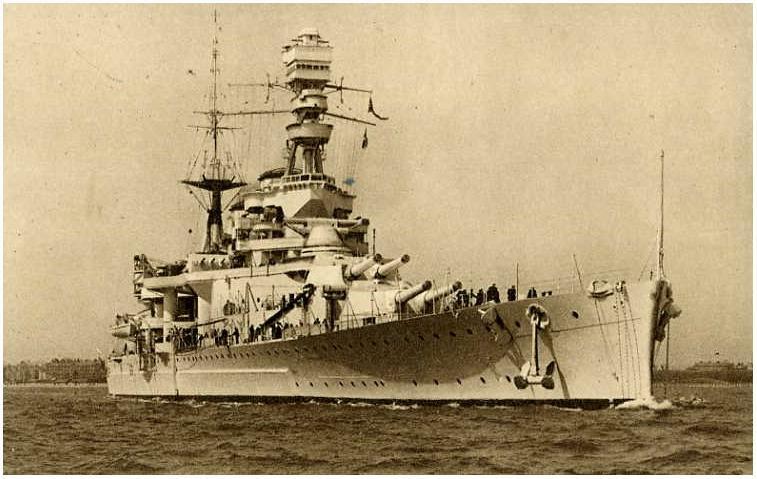 It was indeed HMS Renown depicted above, as seen in June 1933. I've added another image displaying her overall appearance. She is quite a beautiful ship. The overall outline, from this angle, has similarities to Hood, although as you say the complete absence of the secondary guns was a giveaway. My impression on seeing the first photo was that it was of Hood, at about the section of the ship where the fatal detonation that destroyed the ship occurred, and had assumed that was what was mean't by the reference to affinity for details. RF wrote: My impression on seeing the first photo was that it was of Hood, at about the section of the ship where the fatal detonation that destroyed the ship occurred, and had assumed that was what was mean't by the reference to affinity for details. I bought this photo on eBay and it came without any date on the back of the photo. Just a number I reckon to be a library number or similar. What triggered me into byuing this photo was not the rust-bucket-tendencies but another detail. Or should I say the lack of three other details? I'm sure you must have noted it. Where are her secondary guns? "Painting the ship's side in Hood's final colour scheme, AP507B (Home Fleet Medium Grey) at Scapa Flow in October 1940. Note the splinter protection around the four installations visible along the port side of the boat deck (left to right): port pom-pom ('Peter'), Port No. 1 4-in gun, Port No 2 UP launcher and port No 2 4-in gun. Obscured behind No 1 4-in gun is the No 1 UP launcher beside which AB Bob Tilburn sheltered during the last action. The battery is empty and largely plated over. On the spotting top the 15-foot rangefinder has been removed but the director and its hood remain. These alterations were all made in three successive refits between February 1939 and May 1940..."